CBC News has learned that Shawn Atleo, national chief of the Assembly of First Nations, met with Harper in the prime minister's office in Langevin Block on Thursday to discuss progress since a Jan. 11 meeting that followed growing nation-wide protests and a fast by Attawapiskat Chief Theresa Spence. While Atleo and other native leaders have expressed frustration with the pace of progress since that meeting, the Prime Minister's Office on Friday pointed to legislation passed this month to protect drinking water on First Nations reserves and improve property rights for women and children on reserves. Following the meeting with Harper, Atleo wrote to First Nations chiefs and councils, saying he had delivered a letter to Harper from Saskatchewan Regional Chief Perry Bellegarde that asked for clarity on the government's commitment to treaty implementation and reassurance that a senior oversight committee created after the January meeting had a mandate to deal with the issue. "The prime minister re-iterated commitments to ensure oversight and mandate, including his office and the Privy Council, to advance treaty implementation, as well as reform of the comprehensive claims policy," Atleo said in his letter to the chiefs. "As directed by [AFN] leadership, we pressed for clarity on these commitments and the establishment of clear timelines and targets on these commitments and [Harper] expressed agreement to working towards these important next steps." Atleo also met recently with Mulcair and Liberal Leader Justin Trudeau, CBC News has learned. 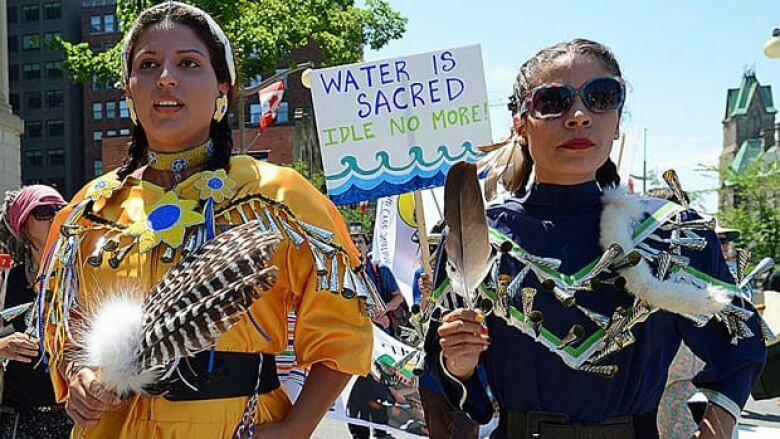 About 150 people started their walk at Victoria Island in the Ottawa River — where Spence staged her liquid-only protest earlier this year — and made their way to the Parliament Buildings. They whistled, beat drums, sang and waved an array of flags as they brought lunchtime traffic to a halt on the bridge connecting Ottawa and Gatineau, Que. Some carried signs that read "A sacred journey for future generations" and "A walk for unity." Activists say the march marks the beginning of a "Sovereignty Summer," which is an offshoot of the Idle No More movement that encompasses other aboriginal groups. The Idle No More cause, which began in December and January, was a protest against the Conservative government's omnibus Bill C-45, which First Nations groups claim threatens their treaty rights set out in the Constitution. Many of those same frustrations were on full display Friday as the crowd gathered on the lawn of Parliament Hill, the empty scaffolding and stage for the coming Canada Day festivities looming behind them. "You've journeyed from many miles, you've come here together in unity with your heart and spirit to raise an awareness that we are a people, we have been here since time immemorial," said hereditary leader Claudette Commanda. "You do this on behalf of your youth and those that are not here yet. "And it is a powerful message that you are giving to all of Canada and as well as to all of the world." A short distance away, inside the Centre Block which houses the Commons and the Senate, a directive went out to all senators and their staff to steer clear of the activities on Parliament Hill. The Senate is still in session, although the Commons is adjourned for the summer. A note from Alain Laniel, acting director of Senate security operations, advised senators and their staff to "avoid any interaction with the demonstrators." Liberal Sen. Lillian Dyck, who was scheduled to speak at the event, took exception to the directive. "I do not believe that the security operations of the Senate should dictate to parliamentarians and their staff with whom they may or may not interact," she wrote in response. Last month, thousands of anti-abortion protesters gathered on Parliament Hill, but Senate security made no mention of avoiding interaction with them. Meanwhile, Nunavut Premier Eva Aariak called National Aboriginal Day an opportunity for an honest inventory of the issues facing Aboriginal Peoples. "This past year, Canadians across the country rallied together to raise awareness of issues currently facing our aboriginal population and to call on the government for a new relationship," she said in a statement. In Quebec, the provincial government announced Friday it will extend a $5 million grant to help 14 Inuit villages fight child poverty. The announcement comes two days after a study by the Canadian Centre for Policy Alternatives indicated that the rate of child poverty among First Nations in Quebec is double the provincial average. Child poverty was also raised in a meeting between Premier Pauline Marois and Inuit on Friday morning. The high cost of goods and services, boosted by the lack of land links to remote communities is a big problem, said Marois. "We realize that it is much larger problem than that targeted by the grant announced today," she said. "However, we are determined to identify effective and sustainable solutions." Marois also announced $1.4 million for the Tursujuq park and $20 million for maintenance of a road to Salluit and municipal services for 500 homes in Nunavik. The premier also signed a modification of the James Bay and Northern Quebec agreement which would give the province 5,000 kilometres of land for development.